It’s hard to have a bad day when you’re in the business of cookies, bars and breads. After all, we make the things that make people happy. We are a relationship-based company where the quality of our people is just as important as the quality of our products. Our environment encourages creativity, and we value an entrepreneurial and industrious approach to work. Simply put, we are a family. A place where honesty, respect and trust are the essential ingredients for how we do business. We take pride in working with creative individuals with a passion for what they do, and we’re always looking to expand our team. See what opportunities are in store for you at any of our New French Bakery, Best Maid Cookie Company and South Coast Baking locations. We employ a diverse workforce of hourly food production, packaging, quality assurance, warehouse, sanitation personnel, leads and supervisors. We also offer a wide variety of professional and management opportunities, including sales, product development, account management, general management, finance, engineering, administration and information systems management. 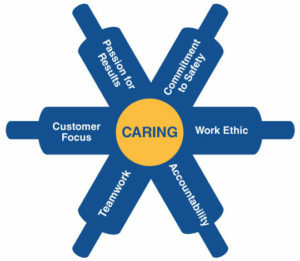 These are the values that differentiate us from other bakeries and provide a strong foundation for all aspects of our business. We will Rise above our customers’ expectations by delivering products of the highest quality, innovation and value in the baking industry. We will accomplish this by cultivating a caring environment where our dedicated and passionate team relentlessly services our customers . . . one bite at a time. We value and appreciate diversity, creativity and the desire to contribute to our team. Rise Baking Company is an Equal Opportunity Employer.